With the M1s & M2s finishing their season, and no Women’s West District fixtures on due to the holiday season, Clydesdale and Clydesdale Western have six teams in action including the L1s. The L1s will be keen to shrug off last weekend’s disappointment when they go in to Saturday’s big game facing familiar opposition. Clydesdale Western will have home advantage in their bid to seal a place in next weekend’s Grand Play-Off Final of Women’s National Division One when they take on Dundee Wanderers in the Semi Final from 3.00pm. ‘Dale Western narrowly missed out on the WNL 1 crown after losing 2-1 at home to tomorrow’s opponents Wanderers. That result meant that a point would have been enough for Edinburgh University to seal the league – and they went a step better by taking three points in a 9-1 win away to Hillhead. 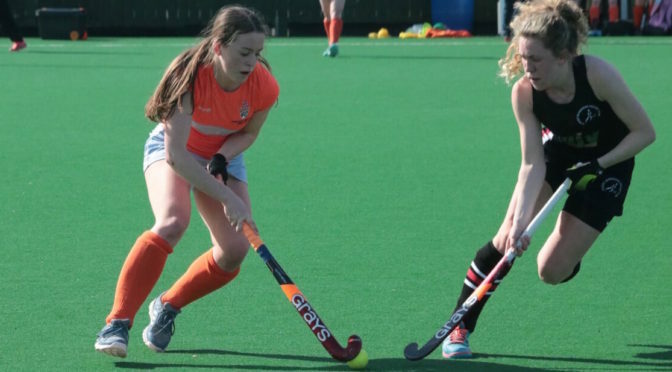 Despite the loss, the L1s finished second in the league table, meaning they will play third place at home in the Play-Offs for the remaining and potentially highest European qualification spot for women’s hockey in Scotland. Dundee Wanderers finished third, which means the two sides will lock horns again following what was a fairly even contest last Saturday despite the visitors win. For Clydesdale Western, head coach Derek Forsyth still has Heather Howie unavailable with a broken arm, whilst Laura Mann is also unavailable. However, Georgia Smith and Anna Hoolaghan are recalled for tomorrow’s Semi Final. For the rest of the ‘Dale and ‘Dale Western teams, both the L2s and L3s complete their season in Women’s Championship Division One tomorrow. The L2s know at least a point away to Watsonians 2s (2.30pm PB) will guarantee a second placed finish, whilst the L3s are already virtually guaranteed to finish fourth when they play Waverley Inveresk Trinity 1s at home from 1.30pm. The L3s hold a three point lead over Edinburgh University 3s, and even if Uni 3s win and the L3s lose, it would require a 28 goal swing in the student side’s favour. The M3s, M4s and M5s still have a few games left before the Men’s West District Division’s come to a close. The M3s are the only men’s team at home as they play Glasgow University 2s from noon. The M5s are at Auchenhowie from 12.30pm to play Western Wildcats 4s and the M4s are away to Glasgow Green to play Rottenrow 2s from 1.30pm.